To find the best way wire up the IR Emitters, I used the LED Wizard located here and fed in the specs of the LEDs and the count. It gave me a couple of solutions and I decided to go with the second. I am powering them from +5v and they will be paired with a current limiting resistor (27 ohm 1/2 watt). On the breadboard this works great and the parts do not heat up even after running for a few minutes. NOTE: make sure you use the correct wattage resistors otherwise they will become quite hot. 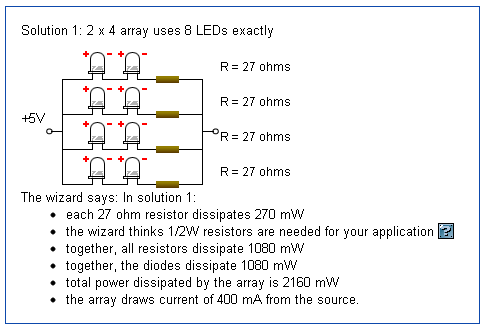 These diagrams and schematics are what I used to document the design for the timer. I did some samples / POCs to figure out what I think would work. That way I could follow this as closely as possible when writing the code and building. However once I built the timer and wrote the code I realized I did not really need some functions (like the status check function) or the start gate servo so these will not exactly reflect the device and code that I used on our track. With that said everything here should allow you to design your own timer but if you get stuck please let me know. Note: I did not create a wiring diagram explicitly for the finish line that shows the connections from the RJ-45 to the various parts at the finish line, but the Breadboard view of the timer shows how they are connected. between that and the Device side wiring Diagram for the RJ-45 you can figure out which pin of each plug will be a lane or the start gate. the design calls for standard Ethernet cables (not crossover!!!) to connect the device to the finish line and the finish line to the start gate.